Both were built in 1905, the pier and the café, a replica of the Spanish galleon “Cabrillo,” years before Venice was annexed by the city of Los Angeles. 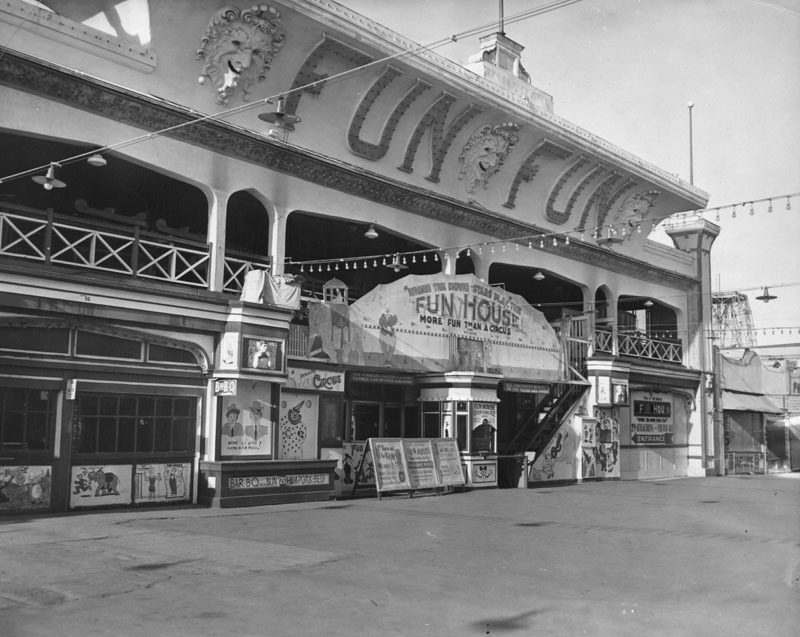 Other amusements grew up around The Ship, which was leased early on by Baron Long. The pier had a reputation for rowdy good times. The Ship, plagued by financial and other difficulties, went through a succession of managers, frequently closing only to reopen again. 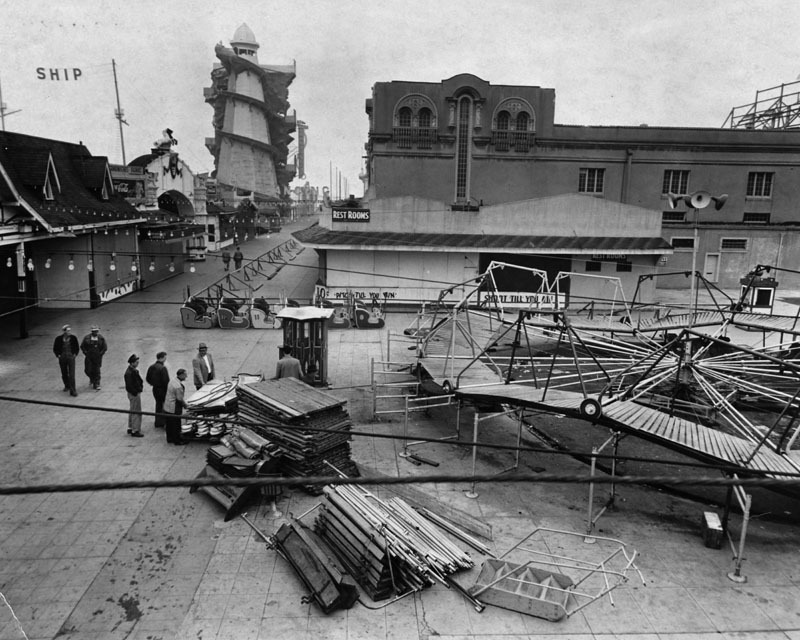 Venice in general and the pier in particular benefited when Los Angeles’ own version of Prohibition, the Gandier Ordinance, went into effect in April 1918, closing saloons and imposing restrictions on alcohol sales for cafes. After-theater parties took to coming down to Venice for after-hours frolicking. But it wasn’t all smooth sailing. 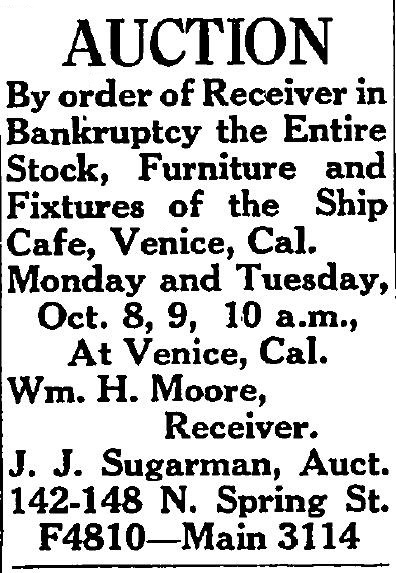 Venice faced its own anti-saloon bill in 1918 (defeated), then in October 1918 the health department temporarily shut down all places where alcohol was served as a precaution against the spread of influenza. 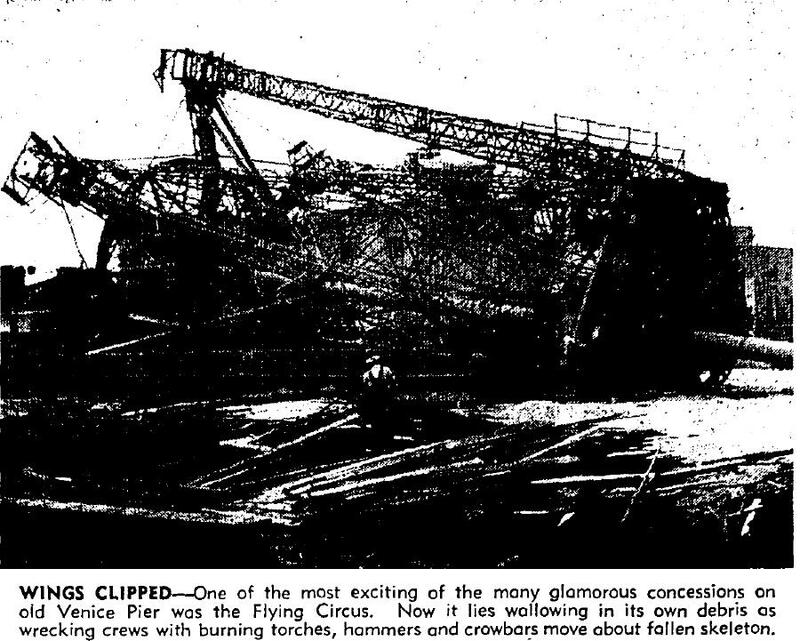 On December 20, 1920 came a report of the fire that destroyed Venice Pier and the Ship Café. They were rebuilt. 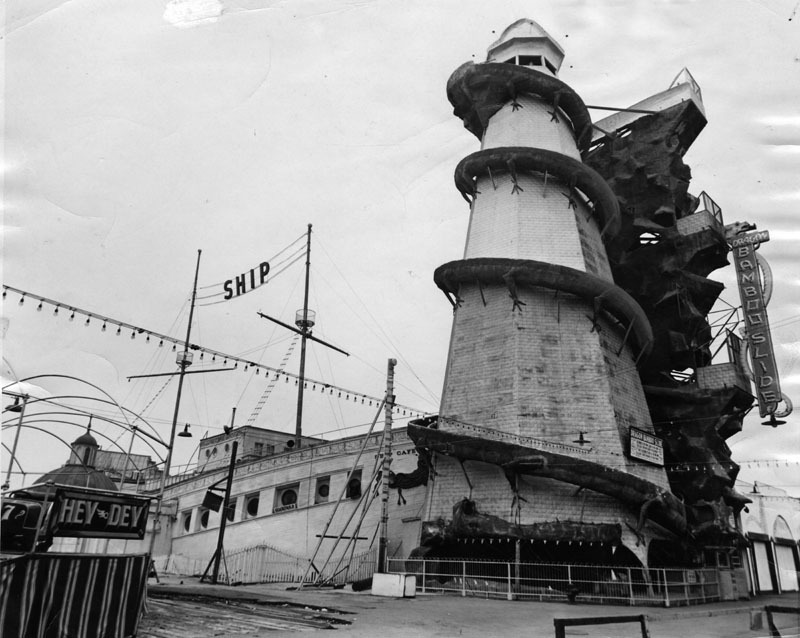 In May 1926 The Ship reopened (again) under the management of Thomas M. “Tommy” Jacobs. An ex-boxer, before Prohibition he’d run Baron Long’s Sunset Inn in Santa Monica and in 1925 was a witness for Farmer Page in Page’s shooting death hearing, along with bootlegger Albert Marco. Venice Beach attracted worldwide attention around the same time, when popular evangelist Aimee Semple McPherson went missing, ostensibly while enjoying a dip in the sea here. Rescue parties were organized, and one person drowned during the search. 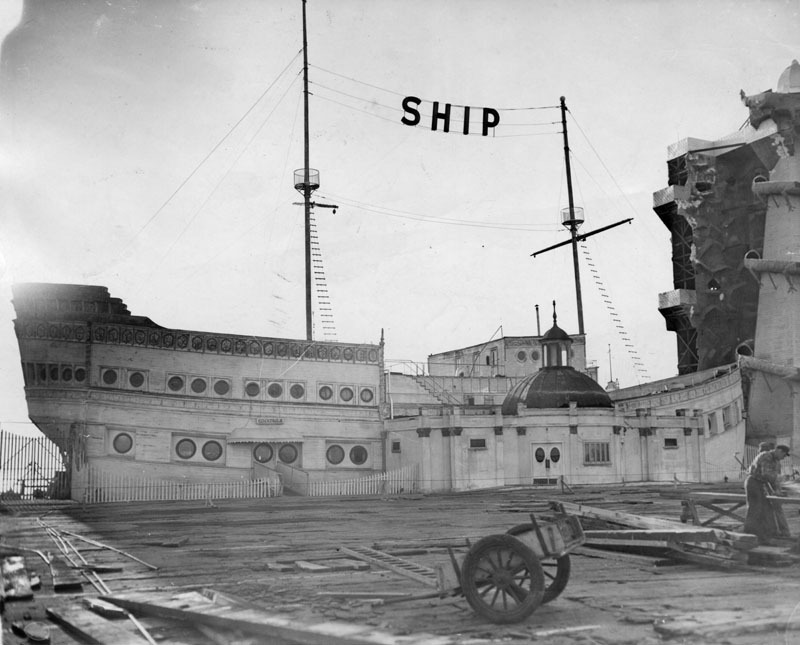 The Ship gained unwanted notoriety when in the wee hours of June 27, 1928, Albert Marco shot and wounded Dominick Conterno in a brawl at the café. Marco had been convicted of violating the Volstead Act in 1927 and, his appeals having been denied, was supposed to have turned himself in to U.S. Marshals to begin his sentence at the time of this incident. Venice and Sunset piers, 1930. LAPL. In the summer of 1929, Venice filled in some (but not all) of its famous canals, converting them to use as city streets. The Venice oil discovery occurred in December of that year, giving rise to the forest of derricks that crowded near the shore south of town. 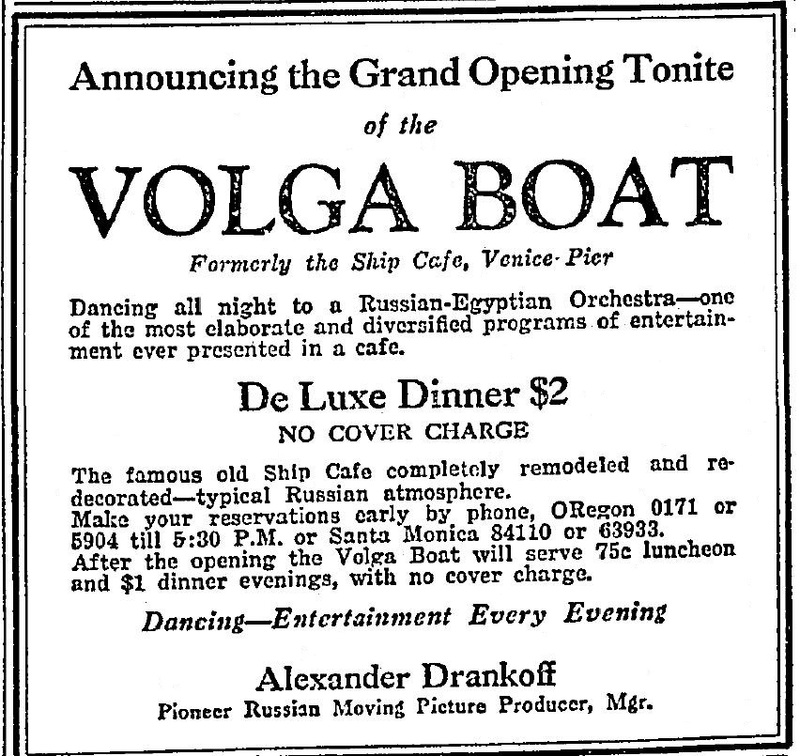 In December 1929, the Ship, having gone through several managerial and name changes, became The Volga Boat. In August 1930, The Volga Boat was recommended for padlocking by the U.S. Attorney General as frequent violators of the federal Prohibition law. 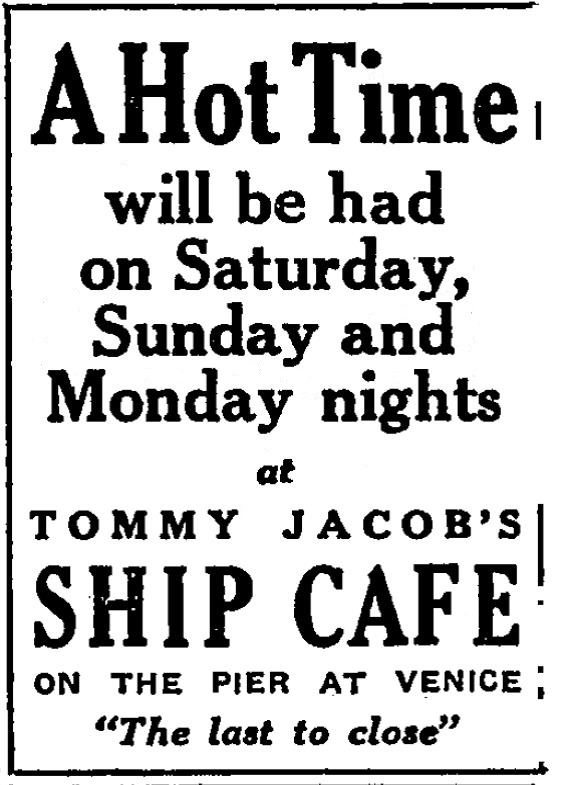 Soon it became The Ship Café again and back under Tommy Jacobs’ management. 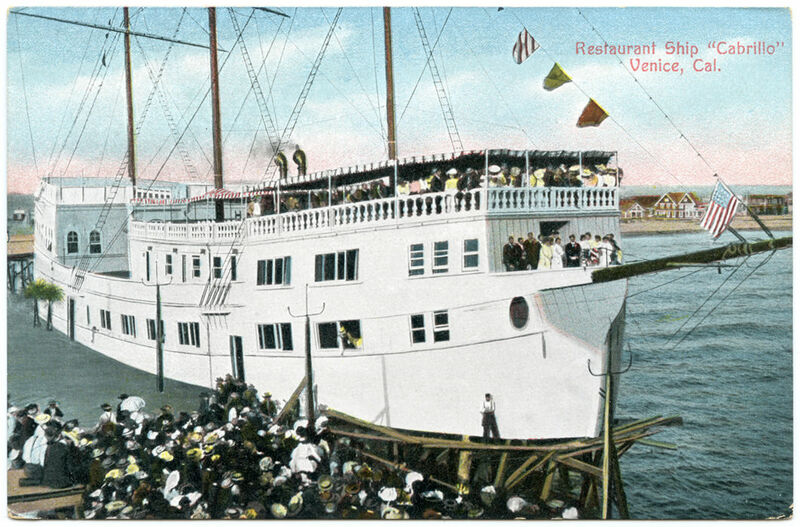 Jacobs, having been affiliated with gambling ships Monfalcone and Rose Isle, was spread rather thin at the time: he was also running the food & entertainment at Airport Gardens (later the Continental Club), which had ties to Farmer Page. 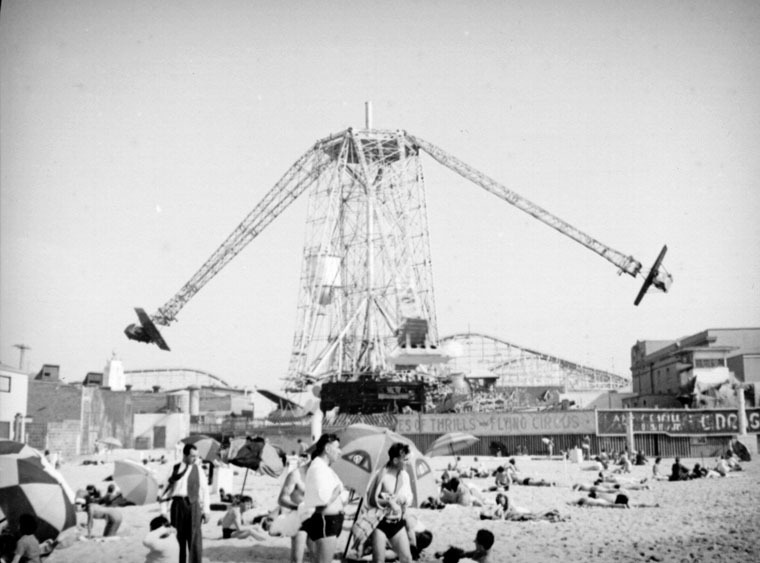 Beach view c. 1937. Herman Shulthius photo, LAPL. 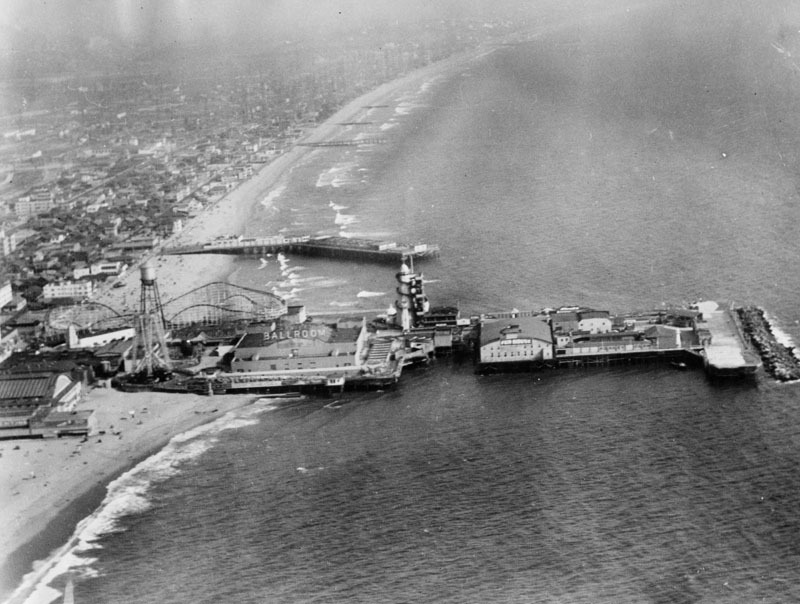 Postcard view of the pier mailed 1930s. The Fun House is at the left, back of the Bamboo Slide at right. The Flying Circus c. 1937. Herman Shulthius photo. LAPL. In January 1946, the Abbot-Kinney Co.’s 25-year lease on the tidelands over which the pier was built expired. 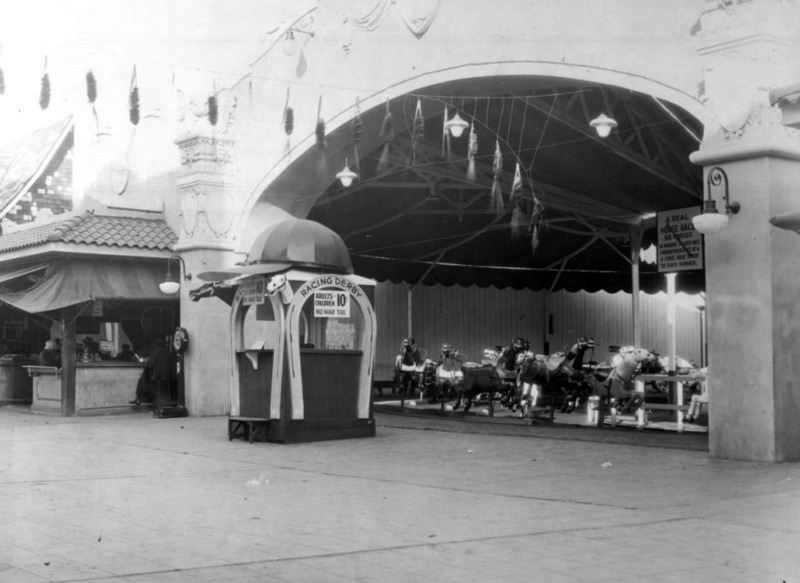 The Los Angeles City Recreation Committee declined to renew it. 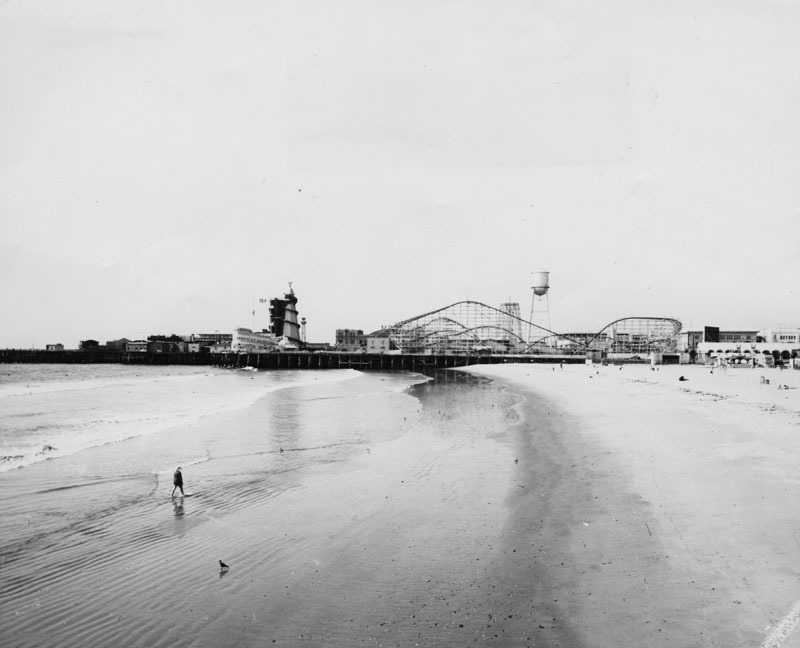 It had plans for the beach which did not include the hurdy-gurdy atmosphere of the amusement pier. There were grand plans to bring in sand from the Hyperion Sewage Treatment Plant to widen the beach, and- oh yeah- clean up the raw sewage. Something that’s never mentioned in the usual nostalgia-fueled reminisces of Venice is that the beach from here to Manhattan (and for brief periods further north) had been under quarantine since April 1943 because of the contamination problem. Swimmers who defied the warning did so at their own risk. 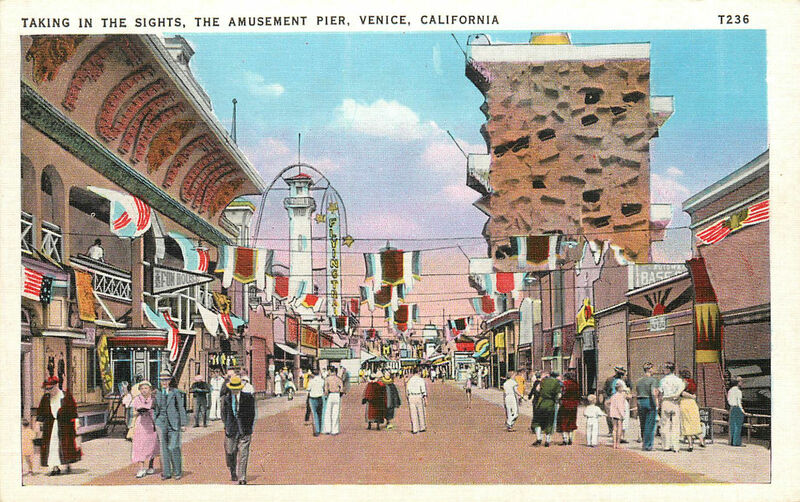 “The Venice of the future will have a greatly improved amusement area, keyed to the modern demand.” said Leo Strickland, manager of Abbott Kinney Co. The pier concessions were given 60 days to clear out. But, although it was duly reported on April 19, 1946 that the pier had closed at the stroke of midnight, it would prove to be a long goodbye. 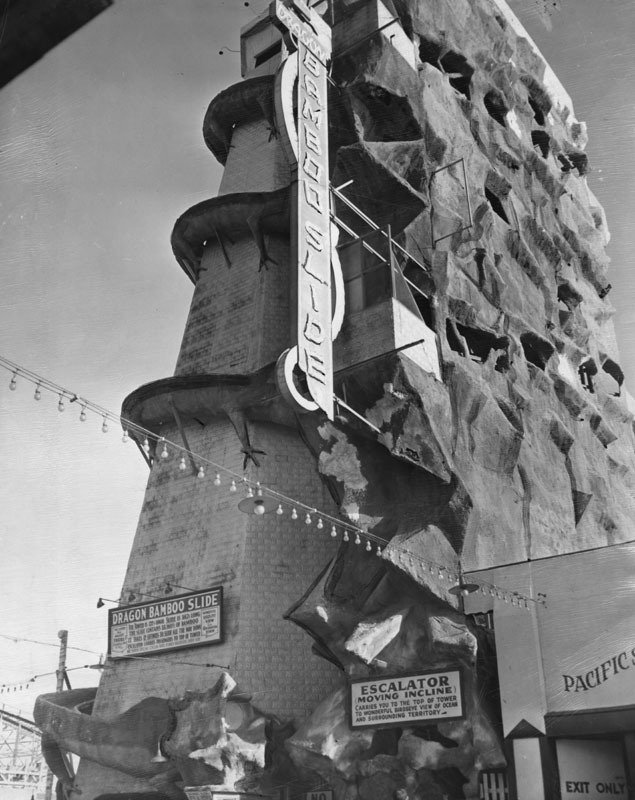 By late September, the famous Flying Circus came down, and the ballroom was being demolished, but other familiar landmarks, like the Bamboo Slide, the Racing Derby, the Fun House and the Giant Dipper were still standing. 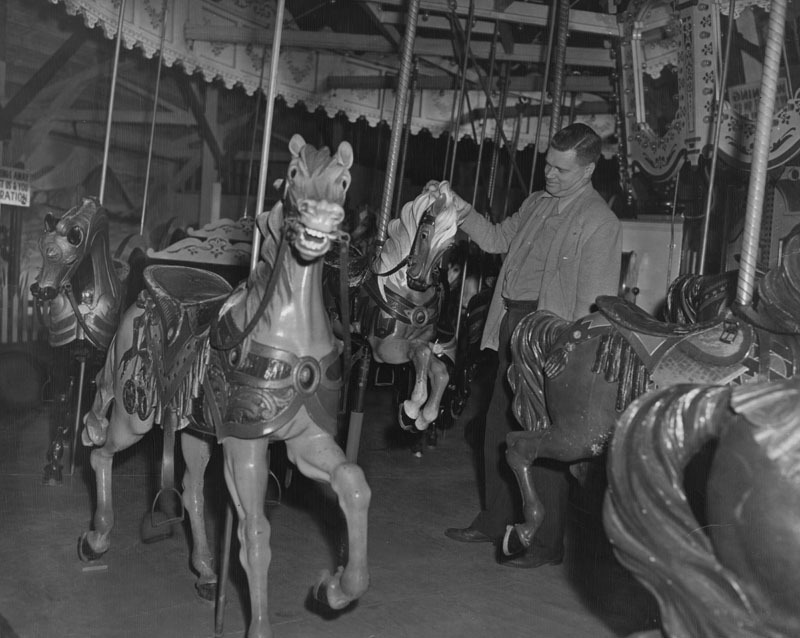 Some smaller concessions remained in operation. The Flying Circus comes down, 9-23-1946. LAT. There had been talk of moving The Ship somewhere else up the coast but it came to nothing. On October 17, its fixtures and equipment were sold at auction. 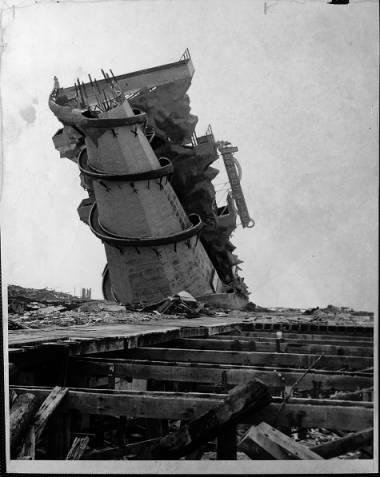 The Ship itself was to be demolished, but it was still standing as of the day before Thanksgiving when a fire broke out at the Racing Derby structure. Patrons at the concessions nearby played on, unconcerned. The Ship in 1946. LAPL. 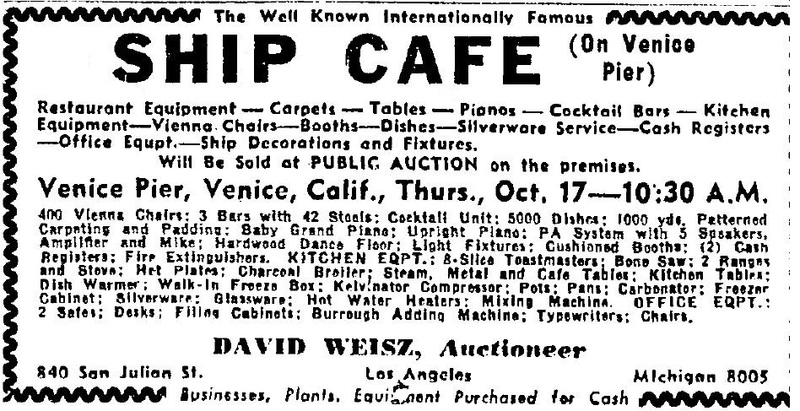 Notice for the Ship Cafe auction, 10-17-1946. The Bamboo Slide caught fire in April 1947. Arson was suspected. Detail of The Bamboo Slide 1946. LAPL. 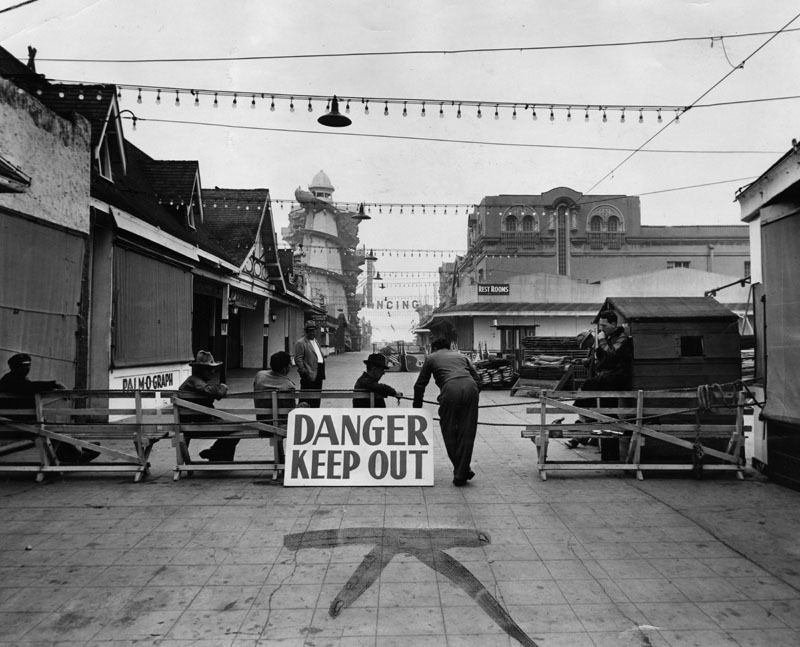 As of July 1947, the city had put up barricades and posted guards at the entrance to keep patrons and troublemakers away from concessions, which still occupied the pier. By the end of the year, the pier was still only partly demolished. 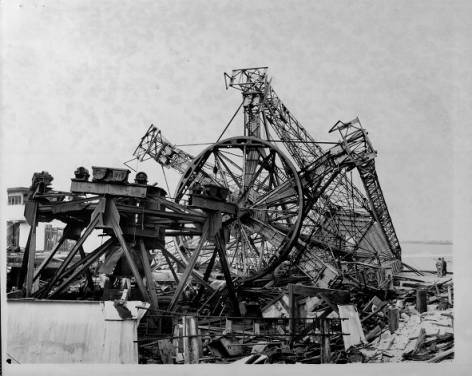 It wasn’t until December 1948 that a contract to remove the remaining pier debris was let, and almost another full year went by before the pier was entirely dismantled, in November 1949. The beach, however, remained under quarantine. 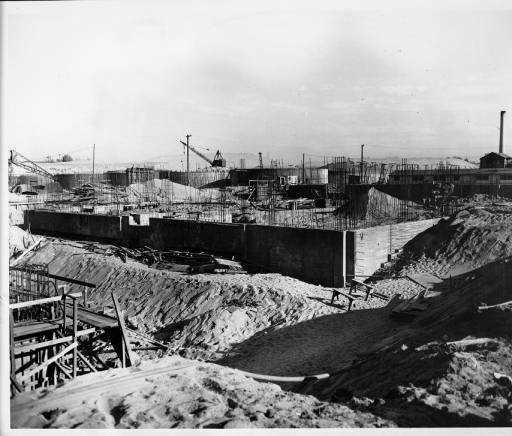 With the expanded Hyperion Sewage Treatment facility functional as of September 1949 and raw sewage no longer pouring into the ocean, things slowly began to improve. The quarantine, now in its eighth year, was finally lifted in June 1950. 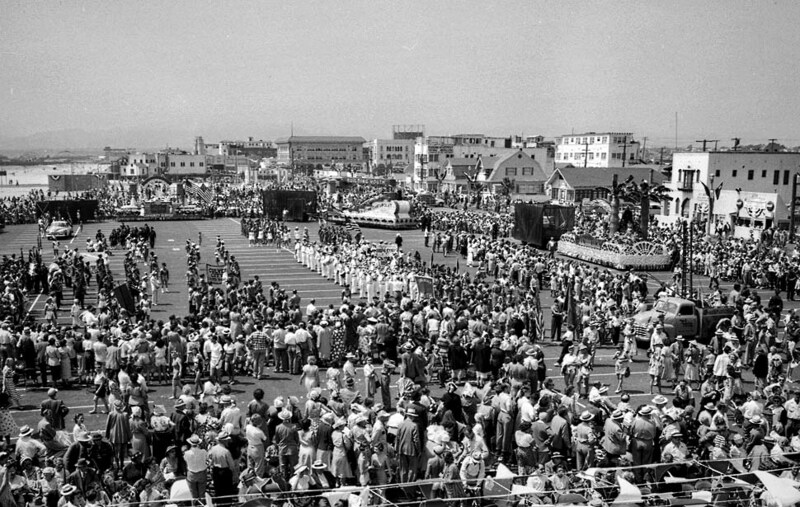 On July 16, 1950, Venice held a pageant to celebrate the reopening of the new and improved Venice Beach. Three years later the city planted 23 palms on the footprint where the shore end of the pier and bathhouse used to stand. July 16, 1950: Dedication of enlarged Venice Beach. From the July 17, 1950 Los Angeles Times.